To the great surprise of most people, the back of the American dollar bill features a cornucopia of esoteric symbols. One of these symbols alludes to the evolutionary task for humanity in the coming era. Concealed in this improbable place, to the left of “The Great Seal of the United States,” is the mysterious image of a pyramid whose capstone hovers above it in the sky. Hiding in plain sight, this image contains a prophectic message that can be deciphered in the light of the ageless wisdom. In esoteric symbology, pyramids represent the convergence of heaven and earth—or the fusion of spirit and matter. The enigma surrounding this particular pyramid is the gap between the stone of the base and the floating capstone, which radiates light from the “All-Seeing Eye of Providence.” If we consider the fact that stone vibrates at the lowest frequency of matter, and light vibrates at the vastly higher frequency of spirit, we find a clue to the meaning of the gap. It suggests a discrepancy in vibrational frequencies between spirit and matter. 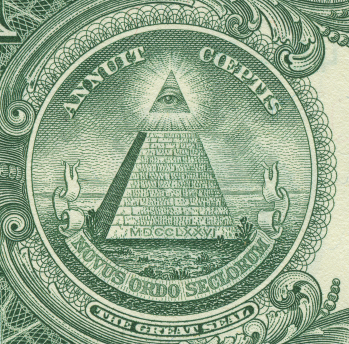 The key that unlocks the symbol's meaning can be found in the Latin words on the circular scroll below the base of the pyramid: Novus Ordo Seclorum or New Order of the Ages. Image and words together seem to say that the new order of the ages will result from closing the gap between the base (of matter) and the capstone (of spirit). The visionaries among America’s Founding Fathers who created the symbol evidently held the ideal of a new world order born of infusing matter with the light of spirit, while realizing that the existing breach between the two would have to be closed in order to manifest that high ideal. These teachings tell us that evolutionary forces have been seeding the consciousness of humanity during vast stretches of time, preparing for this moment of spiritual awakening. A spark of mind implanted in human beings back in the mists of time, nurtured through innumerable lifetimes of experience, has recently been quickened by an inflow of cosmic energies and forces preparing human consciousness for the birth of a new era. In keeping with the divine evolutionary plan, we have evolved to the point that advanced humanity is beginning to see through the glamours and illusions of the material plane. Having identified for eons with our physical form, the human soul is gathering enough light to awaken to its spiritual origin. As the Shift of the Ages accelerates, there are growing signs of the evolutionary plan working out. The changing gears of the cosmic clock have set off a steady wave of crises that threaten the old “order of the ages” while kindling the awareness that will bring forth a genuinely new era. Books, films, and websites about the soul have proliferated in recent years, along with news stories about altruistic people reaching out to help strangers—early signs of the sense of brotherhood that will mark "the age of the soul." To make this new order manifest, however, will require that we move beyond a budding awareness of the soul and learn how to bridge the gap in the symbolic pyramid—between the part of ourselves belonging to the world of matter and the spiritual Self to which we are awakening. Awakening brings the realization that we are creatures of a dual nature, both human and divine. The tension of duality is resolved over time by treading the path of ascent, which leads to the resolution of duality at a higher stage. Along the way, the discordant experience of two conflicting selves acts like the grain of sand in the oyster—the irritant that produces the pearl. The battle between selves proceeds until the higher self gains ground and begins to control the lesser self. Yet the personality clings stubbornly to ancient patterns of self-centeredness until the vibrations of the lower self are raised and attuned to the true Self. When this occurs, the love and wisdom of the Soul infuse the personality and the two become one: the light radiating from the eye of the pyramid permeates the base and the gap is closed. One of the fruits of spanning the inner divide is the capacity to be impressed with ideas from higher realms. The results of this subtle process can be seen in the achievements of human beings throughout history. Those who have penetrated “the raincloud of knowable things” were inspired with new truths and ideas that had the power to transform the world. Among the best known recipients of divine inspiration are the founders of the major world religions: Krishna, Moses, Buddha, Confucius, Christ, and Mohammed. The spiritual truths and insights they received across the bridge of light became teachings of enduring value to humanity. · Through meditation, we learn to silence the outer world in order to hear the inner voice of the soul; we learn to empty ourselves of the ego’s demands in order to be filled with Higher Purpose. In creative meditation, the mind utilizes visualization, imagination and the power of spiritual will to project energy into higher realms. · Through service, we demonstrate an expanded sense of responsibility to the greater whole of which we are a part—the natural response of the soul to fellow human beings and other creatures in the world we share. · Envision, affirm and realize the inner bridge linking form, soul and the kingdom of souls. Through such practices, one learns to live in conscious relationship with the true Self—the Soul. As the path unfolds and the soul enters the foreground of consciousness, one's life is redirected to service and to the divine Plan. Over time, the span of consciousness is built across which the mind is impressed by the divine forces that overlight spiritual seekers and guide the evolution of consciousness on Earth. These forces dwell at the higher end of the bridge in consciousness—in the realms of mind, soul, and spirit. They are known collectively as members of the Spiritual Hierarchy of our planet and Guides of the Race. Their task is to infuse the minds of advanced human beings with vision and inspiration in service to the unfolding Plan of evolution. Higher impressions imbue the mind with greater understanding of the purposes of our Planetary Logos, the Lord of our World, expanding human awareness of the part that each can play in manifesting divine purpose on Earth.